It’s as if you are searching for something that you’re never able to find. What a reader of this blog once told me. A remark I suddenly remembered, as I was watching Rain, version 2016, fifteen years after Anne Teresa De Keersmaeker had put it to the stage for the first time. I realized that person was right. Although I know there are other things in art to aim for than the sublime, part of me will always be looking for that: beauty’s more exalted version. And here it was. 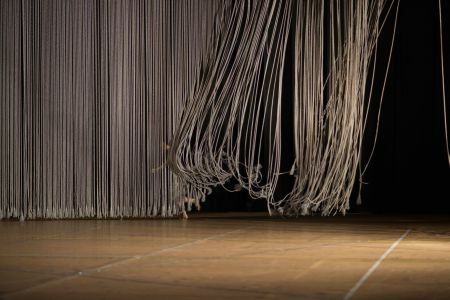 Anne Teresa De Keersmaeker created Rain in 2001, at a time when Rosas was still company in residence at opera house De Munt/La Monnaie in Brussels. 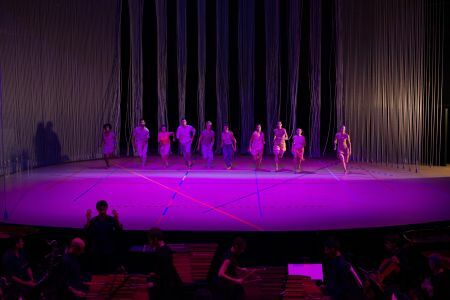 As the Belgian choreographer had done in two previous pieces, she made it to the music of Steve Reich. This time she opted for his Music For 18 Musicians (funny detail: apparently you need 19 musicians to be able to play this piece correctly, live). It was to be the last performance she made with a cast that had been with her for several years – the same cast she created Drumming with in 1998. It was also a piece that came right after the much more experimental In Real Time, created with the actors of STAN and the jazz musicians of Aka Moon. While Drumming, in a certain sense Rain‘s “sister”-piece, has been touring several times since it was created, Rain hasn’t been performed by Rosas since 2006. It was brought to the stage though by the dancers of the Opéra de Paris in 2011, a difficult process documented by Gerard-Jan Claes & Olivia Rochette in their documentary film Rain (review here). Now De Keersmaeker has assembled a new and young cast (1.400 candidates; 250 in final auditions) for this revival of what, in the meantime, has become one of her signature pieces. I consider myself lucky to have seen the new Rain in probably its most ideal setting: the Koninklijk Circus/Cirque Royal in Brussels. It’s a circus-like concert hall: the audience sitting around a circle: the parterre facing the stage. For Rain that parterre section was entirely occupied by the marimba’s, grand piano’s and other instruments (and singers) of Ictus, the Belgian ensemble for contemporary music. They will play the music live only in some of the venues. Watching Rain thus became a twofold experience: you could watch dancers as well as musicians perform. Absolutely riveting. Just as I remembered from years ago, Rain is a piece that sweeps you away from the moment it starts. It lifts you off the ground, takes you along, surfing wave after wave, and puts you down an hour and ten minutes later. And it’s with the dance as with the music: when you think you’ve seen or heard it all, Rain finds a new breath; time and time again. It’s amazing to watch, all the patterns and formations – based on two basic choreographic “sentences”, a male and a female one – the solo’s, the duo’s, the trio’s, the straight lines, diagonals, the circles and the spirals. The colour of the lights changing and the colours of the costumes (by Dries Van Noten, just as in the original version). 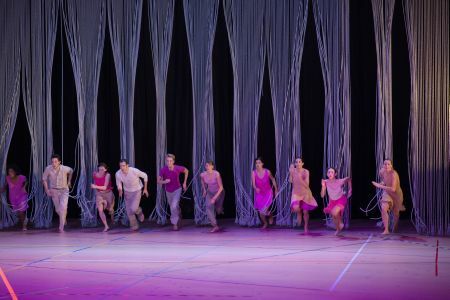 And the dancers of course, in this demanding choreography “continuously defying gravity”, as De Keersmaeker has described it. As always when you’re seeing a piece again after that many years: it’s funny to notice the things you have remembered and the things you have forgotten. I clearly remembered the way it starts and the beautiful way in which it ends, that last dancer catching up with the rest of the company, behind that curtain (by Jan Versweyveld, Ivo van Hove’s set designer at Toneelgroep Amsterdam). What I had forgotten: that odd duet near the end, peculiar in the way that it’s almost an old-fashioned love duo (I wonder: inspired by Gunn’s book?). Probably one of the things Anne Teresa De Keersmaeker would do differently if she were to create Rain now. Just as Dries Van Noten would probably design his costumes slightly different, in 2016. I sat there, in total awe, of the music, of the dance, overwhelmed by the sheer beauty of it all. There’s only one thing that slightly disappointed me. In the original version Rain was a piece danced by really strong performers. The new version lacked those strong characters. Time will tell if these young dancers will be able to put their mark on this new Rain. But: dazzled I was, by this trip. The sublime. Maybe the performing arts have moved on. Maybe it has become sort of an old-fashioned concept. But it won’t keep me from looking for it. This is called Utopia Parkway for a reason, isn’t it? Teaser clips 1, 2 and 3. More info (+ tour schedule) about ‘Rain’ here, about ‘A Choreographer’s Score’ here. This entry was posted on December 10, 2016 at 12:27 and is filed under contemporary dance, dance with tags critique, recensie, review. You can follow any responses to this entry through the RSS 2.0 feed. You can leave a response, or trackback from your own site.